All of us will remember the tragic accident in 2003. Seven lives were lost when the orbiter Columbia broke up upon re-entry to the Earth's atmosphere. I have always had an interest in learning more about events like this one, why did it happen?, could it have been avoided?, and what could have been done differently, are just a few of my reasons for the interest. I know that some fellow members here on this forum also share the same interests in such things, and it is for that reason i post the following link to the CAIB (Columbia Accident Investigation Board) website where the reports into the disaster can be downloaded. I have downloaded Volume One, it's an intensive document, but very interesting to read. 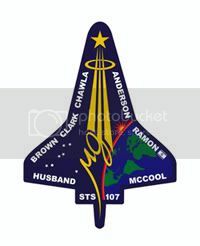 I for one am fascinated how, through various processes they determined exactly what happened to the Columbia during her last few minutes of flight. Reading through the document you will learn that the investigators can tell almost down to the exact inch where hot gasses penetrated the orbiters left wing, and which route the gasses took once inside the wing. I was also fascinated to learn of a small piece of debris that was tracked by radar travelling alongside the orbiter whilst she was in orbit. By a process of elimination the only plausible explanation for this piece of debris is that it was infact a small part of Columbia's wing that had become dislodged from the damaged area whilst the shuttle performed a routine manoeuvre whilst in orbit. The document also reveals how close some of the other missions came to disaster due to design issues with the explosive bolts that hold the solid rocket boosters in place. And sadly, the report also reveals that NASA seemingly learned nothing from the previous Challenger disaster. You will remember from that incident that NASA officials over ruled concerns that were raised by technicians further down the line. In that incident the concern was about the safety of the solid rocker boosters. Shockingly it would seem that a very similar thing happened in the case of the Columbia incident. Once again technicians further down the line warned of a possible problem, this time the warning concerned the photo footage of the lift off and accent into orbit. Serious concerns were made about a large 'foam' strike to the orbiters left wing. Senior officials over ruled and decided no action was necessary. Sadly the events that followed a few days later were to prove them seriously wrong. If only they had listened to those below them. The investigation team, along with NASA engineers took the step of looking at what could have been done if the officials at the time had acted. Firstly, a space walk could have been performed to inspect the suspected damage. And if serious damage had been found the engineers on the ground worked out what could have been done in orbit to overcome the problem. In a scenario similar to the Apollo 13 mission, the crews on the ground worked out how the damage might have been fixed. And if the damage was deemed to severe to be fixed at that time, the possibilities of a rescue mission by the Shuttle Atlantis was looked into - could she been launched in the time available? The overall opinion was 'yes'. Consideration was also given to whether they should ditch the empty Columbia into the Pacific, or manoeuvre her up into a higher orbit with the intention of going back up to her in the future with the necessary equipment to fix the damage. A very interesting report, and well worth the read. Last edited by Steve.B; August 5th, 2011, 02:53. Reason: Correcting a mistake. There have been some very interesting TV shows detailing the accident. I will have to make the time to read the reports you linked. As a side note, because of the drought and high heat in the USA many ponds and rivers have been drying-up. Another piece of the shuttle has been recently found in a lake. I read about that over here, it was that news item that prompted me to search out the reports i mention above. I wonder how long it took the police to think they may have had something out of the ordinary on their hands? If i found something like that in a lake over here i would ignore it has being just another piece of junk dumped years ago. I guess with the history of 2003 in the area it was found, the police will think 'NASA' for many years to come when something like this shows up. Especially when you consider only 40% of the orbiter was ever recovered.